Zodon is unable to stop his attacks long enough to monologue. Really, he needs to work on that if he’s going to progress as a villain. I blame the school system. Actually that’s a rooky mistake . Monologueing is meant for after you have disabled the heroes and got the prize and even then its risky business. What’s really the best time to monologue is ten minutes after stopping your evil plan is completely impossible. Explaining a greater evil situation which is what he needs to do is another story. That’s sort of a feeling of when and if the other person is willing to listen or when its literally the only option. Also doing it from a distance or with a more receptive intermediary are also good ideas. And balancing appearing resionable against giving people who don’t trust you too much info which they could use to stop you is also important. One problem with waiting until last minute is it will look like you are just trying to save your own skin. I mean thats proberly what you are doing but in a save the world because I live there way. On the other hand telling the heroes who don’t trust how you intend to save the world could inform them how to stop your plan if they don’t believe you. I know it wasn’t your intention, but now you’ve got me trying to remember the scene in Girl Genius where the Jagers were complaining about schools today. 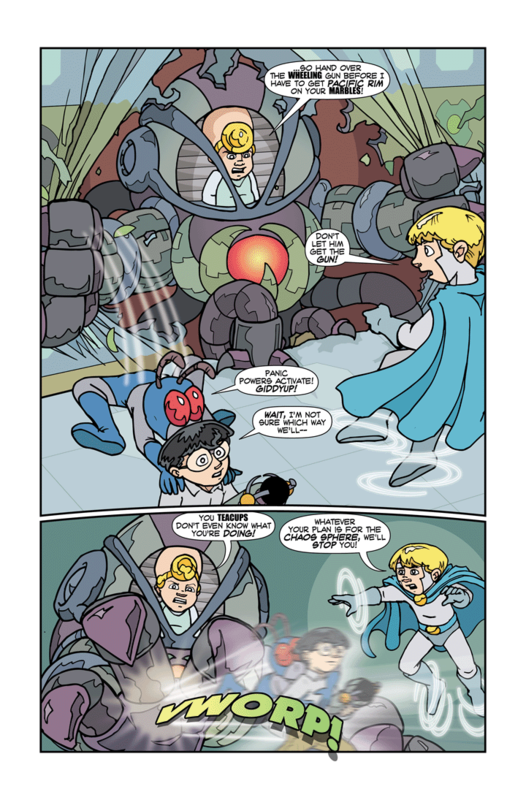 Check the Girl Genius archive for the chapter called “Welcome Home Jagers”. It’s the scene where the jagers reveal that they have already been sneaking into Mechanicsburg (after the Doom Bell has rung). Oh, I found it. Which started an archive binge to current. Girl Genius is dangerous like that. I wouldn’t call Zodon’s dialogue here a monologue but rather combat smack talk. Like Spiderman’s snappy remarks or the taunts and boasts you hear in a video game boss fight. By that standard he’s doing pretty well. Well then that’s the problem right there, he goes to a hero school which has taught him a Hero’s snappy quips and smack talk pattern, instead of a villainous monologue. Let’s see, the Chaos weapon, plus the Chaos backlash, with a side effect of the unknown new powers… Chaos cubed. Let’s take a moment to appreciate how awsome the coloring in the top panel looks. That and how cool the flying effect looks on Toby in color. And now we have sound effects! This rich field of existence can be found in the book “soon I will be invincible”. All I can think at this point after learning about the sphere’s connection to Toby is ‘there he goes increasing his cosmic debt of unrealized Chaotic counter-balancing’. Well that and I wonder if the comic would go dark enough to cover Toby seeing the other half of his powers restored to him and the out-of-control Chaos causing just that across the Earth if not Galaxy to make up for lost time. Reminds me now of a sci-fi story where an absolute klutz and screw-up actually gets picked to explore a new planet complete with silent humanoid robot partner. Eventually he overcomes his flaws and learns that the robot is programmed to ensure regular screw-ups if he doesn’t, thinks he destroyed it but failed, and learns that it’s been accumulating a backlog of bad things to cause to happen in the interim. Luckily he defeats it as it’s not the personification of the person he once was and its programming to fail to counter-balance him results in its destruction when he exploits that programming. Don’t worry, yet. Right now Toby is just flying, he’s always been able to fo that without any sort of cosmic backlash. If he starts doing anything more then we worry; however, I would like to think that Toby is smarter than that. If only because he has Tyler’s brain and Tyler is smarter than that. *waggles hand* Tyler performs better under pressure. His survival skills are more finely honed than Toby’s — out of necessity. It doesn’t matter that all Toby is doing right now is flying, the debt accrues irregardless and he’s done way more than fly since the other half of his power was removed from him. Toby himself even mentions it when he’s telling them to keep the Chaos sphere away from him as he’s worried about he results of the Chaos looking to make up for lost time. Gah! “Irregardless” means “with regard to!” Are you saying Toby’s debt increases with regard to the fact that he’s not doing anything but flying, or without regard to that? And, canonically, even before he got this “fix,” he could fly without causing backlashes. It probably is order/chaos neutral to fly around. Toby had been doing far more than flying around since he had the Chaos aspect removed from him, all that accumulated debt is stored in that sphere and while flying when he was whole USUALLY wasn’t a real problem he’s had ALL of it building up in the time since that half of him was removed. Even just the flying debt if unpaid would grow to a level to be threatening and he’s got all that and more packed away mindlessly needing release because it’s been contained. We don’t have canon asserting that. We do have a moderately-reliable narrator (Toby) telling us that “anything more than flying” causes backlash. Your mental model may suggest “there was backlash, but it was so minor nobody noticed,” but that’s not backed by canon. You could turn out to be right, of course, but if so, that’s a good guess, not actual deduction from canon. Of course we’ve got canon that backs that up, Toby’s powers HAVE to have a negative countering a positive and vice versa, we know that from what was done to his powers by the imp and cherub. Flying HAS to have to have some kind of backlash, just because it’s not obvious doesn’t mean it doesn’t exist, because we know his powers have to have a backlash that’s how they were tampered with to behave. We know his Chaos aspect is still linked to him, it’s what led Ron there, that aspect HAS to be storing up all the countering effects it’s been kept from releasing because that’s going to be an offshoot of the tampering. About the only good thing that’s happened in that regard is that presumably the use of it as a weapon around the base and the warping of the surroundings is channeling that in a somewhat safe fashion, forcing it to act at a time of the user’s choosing. The Chaos associated with flight would be things like disrupted air currents, violation of the laws of momentum, telling gravity to go sit in a corner and cry, etc. Lots of little things, instead of one big one. Nightmask, we do NOT have canon saying positives must be offset by negatives with Toby’s power. We have canon saying Order must be offset by Chaos, and vice-versa. These are not the same thing. If flying causes neither Order nor Chaos, then it has no “backlash.” Or, if it causes both in equal amounts, same difference. Given that Toby framed his constraints as “If I do anything more than fly…something else happens” (paraphrased, as I’m not looking up the quote), and that he also gets an idea of what the backlash would be, he knows there’s no backlash that he’s warned about for flying. I personally think it is order/chaos neutral, is all. Now let’s see what super screw up boy can do? Which boy is that? I see two candidates for that nickname. Man, I really want to know how exactly Ron’s powers work. He gets around, but how we don’t know. He’s defying a lot of laws of physics doing so, such as walking on walls or going through walls. Now, he sort of implies he doesn’t know where he’s going, just that he can sort of “follow a path” His vision definitely has something to do with it, from seeing paths to seeing connections. What would be the simplest, most concise, most clear, “Oh, wow, now I get it” way to describe and explain his non-FISS powers? One of the theories I’ve liked do far is that can see and act in the fourth dimension. It would explain some of the bizarre abilities he’s been exhibiting. Including the abilities exhibited at the game booths. What dialogue we’ve seen from Zodon so far he’s trying to protect everyone from the shoddily shielded sphere of pure quantum Chaos separated from Toby. He was able to detect its existence from the school it seems like and knowing the heroes wouldn’t trust him apparently put together his plan in order to access it and properly contain it (and it let him work out his aggression towards Tyler at the same time). He almost certainly has plans to harness it for his own ends, as well, but frankly, I suspect he’ll prioritize containment and he’ll do a marvelous job at it if given the opportunity. Zodon has heroic tendencies almost as strong as Tyler’s; he just also behaves much more like a kid than Tyler does, in that he doesn’t stop thinking about how he can have fun while doing it. …and now I want to see the Flea and Zodon have a team-up adventure. If Zodon could get that chip off his shoulder for thirty seconds, he could see how he and the Flea have a lot in common. Zodon isn’t above wise-cracking; he just doesn’t appreciate it in others because he is too used to it being directed at him if ANYBODY else is doing it. So. Zodon watched Pacific Rim. Watch as Ron joins the EDL (Somehow), and that becomes his name, despite not being related to Ultima, Quantum, or Sovereign. Zodon isn’t trying to blast anyone or anything. He’s trying to grab the chaos sphere (or Ron, since he’s holding the thing). Blasting might well break the maguffin, which would probably be a bad thing. I agree with that analysis. If anybody “zapped” them, it was Toby, but I think it was just Ron’s powers. Captcha’s getting fun, it’s going past first grade math. I got 12*15. You know, Zodon might be the best option here. The chance that anyone will be able to completely destroy the orb or its effects is fairly low (chaos and order are balanced). The same goes for simply containing the effects forever – it would build up to a vast chaotic potential. But if a villain used it, Quantum Powers and the villain would sort of balance each other. And Zodon is probably one of the better villains to use it – despite his megalomania, his actual damaging effects are low and he doesn’t kill. Careful. “Chaos” isn’t inherently villainous, and, more importantly, villainy isn’t inherently chaotic. That said, I agree that Zodon is probably the best hands for this out of the options we’ve seen. Unless Ron’s powers are “probability”-fueled, in which case giving him some raw chaos to manipulate might be potent.